I think the best gifts I receive are food related, specifically fresh produce. So I felt lucky this weekend when my Dad walked me out to their garden and dug up enough vegetables to last us a week. I don’t have specific plans for most of it, but the potatoes and peas were first on my list to use. 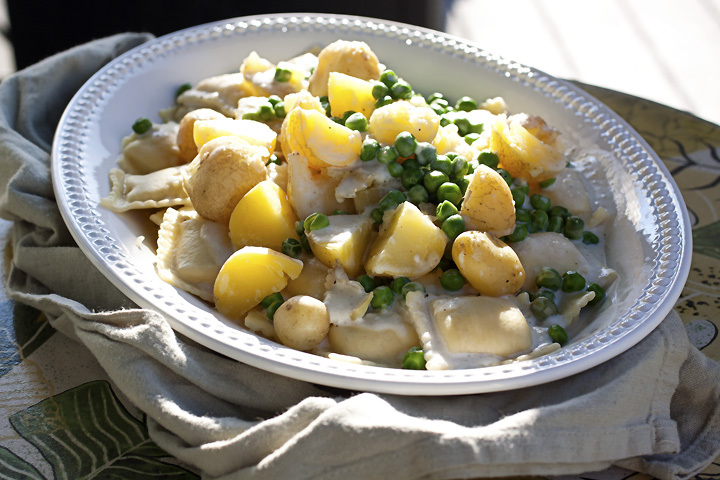 At my parents, meals are centered around meat with veggies as a side, but I thought I’d turn their creamed potato and pea recipe into a late summer vegetarian pasta dish. Jesse and I enjoyed this interpretation on a classic recipe, and using frozen ravioli kept it quick and inexpensive. Clara on the other hand just ate the potatoes, but as a picky 9-year-old she believes ravioli should only come in cheese. If your peas are fresh from the garden they might take about 7-10 minutes to cook, but if they come frozen, only boil them for 3-4 minutes. 1. Bring a large pot of salted water to a boil for ravioli. 2. If potatoes are large, half or quarter them into bite size pieces. Bring a large pot of water to a boil over high heat. Boil potatoes for 10 to 15 minutes, or until tender. About two-thirds of the way through cooking time, add the peas. When both are tender, drain the pot. 3. In a saucepan, melt butter over medium heat. Stir in flour to make a thick paste; gradually whisk in milk, stirring constantly until slightly thickened. Season with salt and pepper to taste. 4. Meanwhile, cook the ravioli according to package directions. With a slotted spoon, move cooked ravioli to a platter. Cover with potatoes and peas then poor sauce over the top. I cannot even tell you how exited I was to see butternut squash in that title! And then you topped it off with a delicious veggie sauce. Yum! Where have you been, girl? Glad you're back with a lovely recipe--you did your Dad's garden veggies proud! yummy! This sounds so delicious and amazing! I love potatoes, peas and squash. Amazing! Claire will come into her own and appreciate all the great stuff mom makes. It may take a while, but she will. I am going to miss summer, not the heat but the abundance of fresh veggies that have been given to us also. We pulled in quite a few tomatoes this year and very much enjoying the herbs. This sounds so good, and i like the shot in the sunlight!! There is nothing better than receiving fruit or vegetables grown by someone you love. And then making your own special meal. Just splendid. This looks delicious, my friend. Thank you for whetting my appetite!